LIMA, Peru (AP) – The tradition of having black pallbearers to carry the ruling elite and the rich and famous to their tombs in Lima is one of the most blatant signs of the entrenched racism that continues to be practiced. Elegant in tuxedos and white gloves, the six black pallbearers silently and gracefully remove the mahogany coffin bearing a Lima tire magnate from his mansion. They slide it into the Cadillac hearse that will parade Jorge Reyna's body through the Chorrillos district where he was once mayor. The pallbearers are in the job precisely because of the color of their skin, a phenomenon unique to this South American capital that was the regional seat of Spain's colonial empire for more than three centuries. In fact, prominent citizens such as Reyna, a widely respected, charitable man of indigenous origin who died at age 82, request black pallbearers for their funerals. "He planned his funeral and wanted it to be elegant," said Reyna's widow, Clarisa Velarde. Blacks routinely bear the caskets of ex-presidents, mining magnates and bankers to their tombs in Lima. The peculiar tradition exists neither in provincial Peruvian cities nor in other Latin American countries with significant black populations such as Brazil, Panama and Colombia. It is not a profession chosen by Lima's blacks but is rather thrust upon them by a lack of opportunity, say Afro-Peruvian scholars. And racism remains so deeply ingrained in Peru that many don't consider the practice discriminatory. "Beyond the question of racism or prejudice, I think it is simply a question of employment," said Jose Campos, a leading Peruvian black studies scholar and vice rector of the National Education University. For 61-year-old Armando Arguedas, who like his fellow pallbearers never finished elementary school, it's simply a job. "Some people are friendly," he said of those who employ him. "Some don't even say thank you." Black pallbearers were even used for the recent funeral of the wife of former U.N. Secretary-General Javier Perez de Cuellar. "We were never treated better," said Arguedas. "The family members thanked us and paid us triple." Blacks are all but absent from Peru's business and political elite and although slavery was abolished in 1854, only 2 percent of Peru's blacks go to college. Afro-Peruvians are consigned largely to manual labor including as field hands in sugar cane plantations along the nation's Pacific coast. 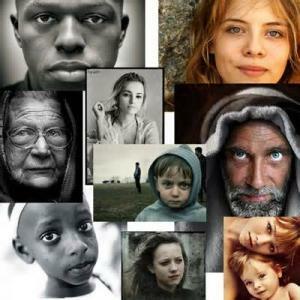 Census-takers don't even register black Peruvians by race. They are estimated to account for no more than 10 percent of the country's 29 million people and only in 2011 did the country get its first Afro-Peruvian Cabinet minister, the internationally renowned singer Susana Baca. Her mother had worked as a maid in rich people's homes. 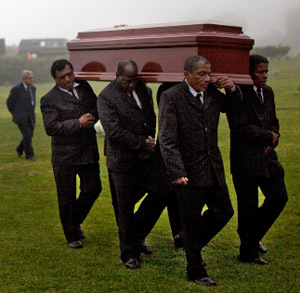 Black pallbearers are a legacy, historians say, of the bulk of Spain's colonial nobility in South America living in Lima and routinely keeping a sizeable retinue of house slaves. A historian of Peru's slave trade, Maribel Arrelucea, said that "to have one's body carried by a black is understood by many to be a symbol of prestige, just as it was in the colonial era when the aristocrats of Lima went to church accompanied by a slave." Tanya Hernandez, a professor at Fordham University in the U.S. and author of the book Racial Subordination in Latin America, said the tradition also reflects "problems in the entire region with descendants of Africans who have no space in public life or ways of advancing in the economy or politically." Peru's most prominent funeral director, Agustin Merino, denies the tradition is in any way racist. His funeral home offers black pallbearers by default, unless clients ask for another option. "It is a custom introduced by the Spanish," said Merino, 81. "The pallbearers were always used in the burials of the wealthy." He credited black pallbearers with knowing better than to be "laughing or making faces" at funerals. "They need to be serious," Merino said. Adam Warren, a University of Washington professor who has studied Lima's funeral culture, said that in colonial days the tradition was "considered both an expression of status and an act of reverence for the dead. "It bears adding that families (of the deceased) sometimes hired other Afro-Peruvians to participate in funeral processions," he said. "The slaves also sometimes followed the casket." "To be honest, I have to confess that the very idea makes me sick," Warren said. Lima has about 50 pallbearers, organized into teams, and each man earns $5 per burial or about $70 a week, the equivalent of minimum wage. They are contractors, not funeral home employees, hired on a per-job basis with no benefits. In Arguedas' case, it was one of the few jobs that the former drug addict and convicted armed robber could find. "Christ is the only one who doesn't discriminate," he said as he walked home from work through the mean streets of Malambito, a Lima district rife with drug abusers who smoke partially processed cocaine known as "base." He now belongs to an evangelical church where he leads weekly prayer meetings. His co-worker Ivan Rivas, 60, said he ended up in the job after being laid off from a soft drink factory where he was a cook. He lost another job as a security guard at a school that went bankrupt and closed. "There was nothing left for me than to be a casket carrier," said Rivas, a white-haired single man who lives with his mother and bets on horses, as he dined on a cheap lunch in his neighborhood. In 2009 the government of then-President Alan Garcia issued a public apology to Afro-Peruvians for a racist tradition of colonial slavery but still they never received reparations. A year later, his government suggested Lima funeral homes stop employing blacks exclusively as pallbearers. Nothing came of the suggestion. Afro-Peruvian activist Oswaldo Bilbao called the apology "pure demagoguery." "It's one thing to ask forgiveness and to later improve educational opportunity for Afro-Peruvians, give them access to jobs and health care," he said. "But nothing has changed in the interim in the black communities on the coast. Everything is the same." At a service this month in Lima's upscale Miraflores district for his grandfather, who died at age 97, Karim Olaechea said he was taken aback by the tradition after traveling from his home state of Pennsylvania to attend his first Lima wake. Other members of his family didn't think twice about it. "It was shocking for me," said Olaechea. "Peru has a racist society."